I read a lot of negative reviews on putting this cabinet together however, I did not have any issues. The final product was great for the price of the cabinet. The only reason for the four start out of five is because the doors opened sightly different-one side opened further out then the other one. But not so bad that I cannot use it or anything. 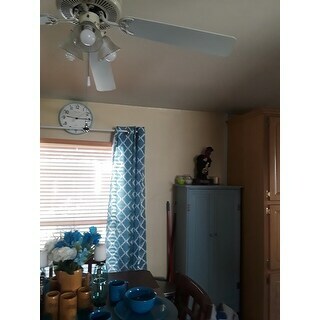 It is spacious enough however it is perfect for the space I purchased for. 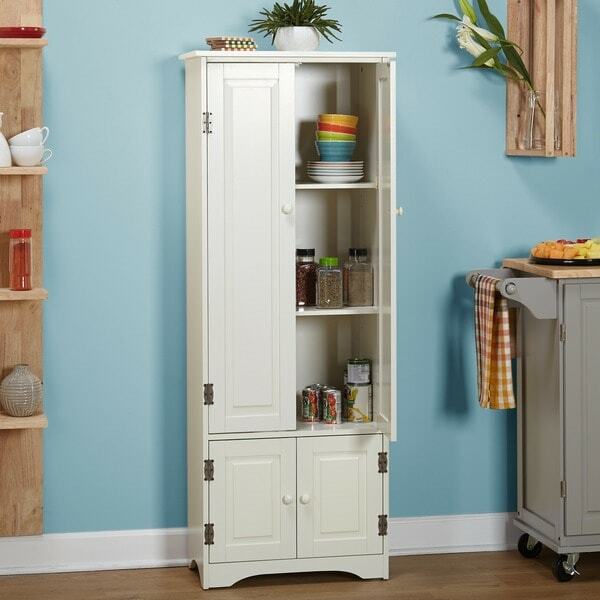 Keep your kitchen organized with this wood cabinet that features a fixed-size shelf, two adjustable shelves and additional storage space behind the two lower doors, ensuring this cabinet meets your storage needs. Make sure this adjustable shelf cabinet looks great with your current decor by choosing between a white or weathered honey finish. 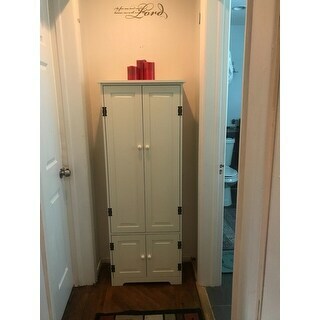 Had been considering this cabinet for weeks and finally purchased in the white. I consider myself an experienced furniture assembler who enjoys it and my home is crammed with "rustic" assembled pine furniture, so I discounted the remarks about "wobbliness" and other issues. Well, pride goes before a fall. While made of very soft, lower grade pine with plenty of filler, there seems to have been some care done in the design and assembly instructions. The hardware is various, the cams are strong but the additional screws strip easily. For the most part, holes were drilled correctly, more or less. I coped with 1) Big holes for the thin dowels were lavishly filled with wood glue, but at least all the holes were drilled deeply enough. 2) Re-drilled enlarged cam holes were off in 2 spots, so when the cams were tightened the wood split a bit, also glued 3) Off-drilled pilot holes for the doors - by deliberately forcing the screws I got the doors more or less straight, but the cheap hinge design doesn't allow for adjustment. In the future I may replace the hinges and the plastic shelf pins (I added 1 inch L brackets already top and bottom for more stability). 4) A knob pulled off immediately - there is a little metal collar in the knob to hold the screw, bu the pine is so soft it just pulls out - replaced with longer wood screw. When assembly was over, I had a headache, an eye twitch, and had to go lay down for a while. But, you get this together and it is just so gosh-darned cute, fit the space in my tiny kitchen perfectly, the 5-foot height is great as it fits under fixed shelving and you can put stuff on top, and it's real wood - now assembled I am very happy with it. With all the issues there are a lot of good things to say, like the pre-drilled holes in the pressboard back, the sides are not plywood, the holes were mostly drilled correctly and it went together square (no pounding with a rubber mallet), nice cream color, well-packed, good instructions, holds tall juice bottles etc., and the nice paneled doors. So I'd say purchase this with the reservation - have wood glue on hand, experience is useful, and so is having extra misc. hardware and tools. Definitely a rustic piece with a lot of charm when assembled - also fast ship from Overstock. I was looking for a tall cabinet to fit into a narrow space in my kitchen to add some extra storage & this cabinet fit the bill exactly! This looked so good online that I ordered two of them. I thought they would be perfect for my laundry room. Well, my husband has put together a ton of furniture lately. He has put together three bookcases from Target, a very large storage cabinet from Lowes, and a host of other items. He is very experienced and always glues all of the seams for a sturdy outcome. Well, these were not tall by any form of the imagination. The hardware is not adequate at all. The shelf holders are the same small plastic holders as in our medicine cabinet. 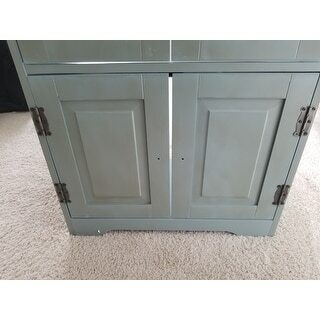 The handles are not great and the screws to hold the hinges are so tiny they would not be secure. I had read the reviews and thought I would just get what I needed at Lowes to make it sturdy. The cost of the parts we needed was $30 for the two cabinets and we didn't replace anything we didn't need to. I purchased as inexpensively as I could. All of this being said, when the cabinets were put together, they have a nice look. I am not using them in my laundry room, just wouldn't work out. I am using them in the kitchen for two very small pantries. We put black ceramic knobs on them and it added a nice charm. So, the finished cabinets look nice. 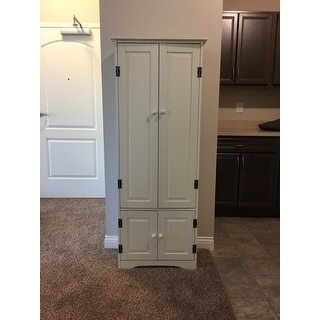 If you are in the market for a narrow cabinet to fit into a tight space, this will do the job if you are willing to spend the extra money to purchase the parts needed. I just feel for the price, it would be nice if the parts were of a decent quality. You should not purchase this if it is one of your first items to put together. You need a little experience to know what to buy at the hardware store. 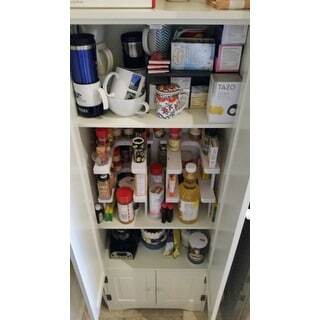 I needed a cabinet to use as a pantry. Others I looked at were not very tall. This cabinet fit my needs. It is easy to assemble, and looks good. I wanted a white one, but they were all out, so I painted mine white & it looks great. I'm very pleased with this purchase. So I was excited for this piece; it was simple to assemble looked nice aesthetically and serves the purpose for which I needed it for(more storage). However I was slightly disappointed because extra tall it is not, it looks white in picture but is more of an off white and I wished it was just a couple inches wider even after reading the dimensions, other than that I would absolutely recommend you buy this if you need it. I spent a couple of weeks looking for a hall cabinet to store my toiletries. I went to every local store, the "home" stores, online stores, auction sites, etc. Everything I found was fake wood, and not cheap or real wood and very expensive. Then I found this cabinet. The price was a tad more than I wanted to spend, but I figured it was real wood, so it would last a long time. I was worried after reading the reviews though. Most people had the worst time putting it together, had to re-drill holes, stated parts were missing, claimed it's top heavy, etc. I must say, I did not have that experience at all. It arrived within a few days, and the packaging was excellent. I am pretty handy around the house...enjoy putting things like this together. But, again, I was concerned over other reviews. Well, I poured myself a glass of wine, turned the tv on and settled in with my screwdriver and wood glue. About an hour and a half later I was all done. I must say this was very easy to put together. The directions were simple to follow. Yes, the dowels had to be glued in, but I always glue dowels when building something like this. It just provides extra strength. The reviewer who stated it's top heavy because it fell over when he was screwing the back in...well, why wouldn't you lay it down and screw the back in? Common sense!!! It is absolutely not top heavy. I have all of my toiletries inside, and on top I have a large candle and some decorative items. I'm not concerned at all about this cabinet tipping over. It is very stable. Several people stated their handles "pulled out" because the pine is soft. I've had the cabinet for over 2 weeks now and I did not experience this problem. I also had plenty of screws for the project. Note: pay attention to which screw your using...if you use the wrong screw in the wrong place, then you will run out of screws in another place. Now, I did have a problem with one of the upper doors. It doesn't line up exactly with the other door...it's a smidge off. But it still closes just fine, and when I get an extra 10 minutes I'll re-drill new holes, re-position the door and wood fill the old holes. No big deal. Oh, and the honey color is very nice. It's like natural wood with just a light stain. This color would blend in with a lot of color schemes So, bottom line is this: this cabinet is great! For such a low price you can not find a better cabinet. The two cabinets arrived fast and in great shape. The packaging did its job, though a bit too much Styrofoam. The units were solid pine wood as advertised, but not long or wide boards, but more like shorter pieces spliced together. In spite of this, the finished cabinets do look nice and function as expected. The assembly instructions were clear, the parts were all included in separate packaging for different stages of assembly. The units were easy to put together and light enough for one person to handle the construction. The cabinets went together perfectly; square, plumb and even. The only deviation I may recommend is regarding the hinges for the doors. 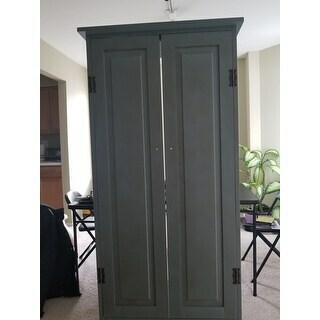 The hinges only open to 90 degrees as delivered. If you work the hinges carefully and without to much force, you can make them more flexible so that they can open beyond the 90 degrees, thus making the doors open wider for better accessibility to the interior of the cabinets. If you are thinking of doing this, do this before you install the hinges onto the doors. Overall the units were a good value, easy to assemble, functional and good to look at. But they weren't as tall as I expected. 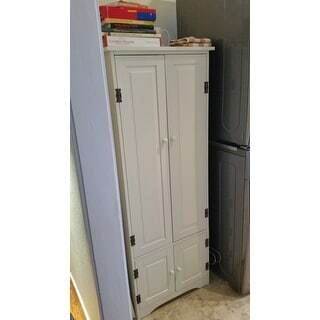 I just received this extra-tall cabinet in the antique white color and I'm not 100% happy with it. It has a crack in the wood in the lower door, which if I didn't have to ship all the way back, I would have returned. The bottom is also yellowed and it is top heavy, so much that it fell over while I was screwing the backside in and could have been a disaster had not someone been there to catch it for me. The top heaviness could definitely be an issue unless you put some heavy stuff maybe in the bottom. But, overall, its ok for the price and the fact that it is real wood is a plus. I wouldn't buy another, but its good enough to keep and not go through the hassle of sending back. If you are looking for cheap storage in a small space, then it is probably fine for that. Very poorly made product. Wood is bowed. Front door is cracked. Not sturdy. Top heavy. 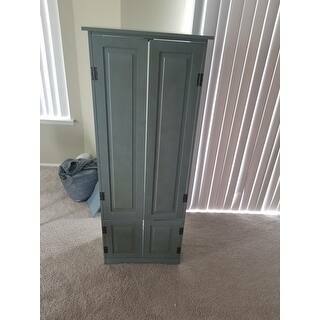 the pine cabinet is very nice, not bulky and easy to fit together, real pine wood and doesnt look out of place with the other furniture if you have a small apartment and it cannot fit in the kitchen. I was very pleased with this product. I did not find the assembly as difficult as other reviewers, but there definitely were a few pre-drilled holes that were slightly misaligned. However, the extra effort to overcome these minor flaws was well worth it. The cabinet works well for my purposes and looks great. Nice cabinet in my kitchen. The white stain used is OK, but will at least make good basecoat if I decide to repaint it later. There were no assembly instructions in the box, but it went together easy anyway. The cabinet was a bit unstable, but with a few extra screws and some wood glue that issue was taken care of. Bought 2 of these for storage. Easy to put together if you read the directions. Not heavy, bit durable. I replaced the provided shelf pegs with some sturdier ones I bought at Lowes. I also painted them a dark chocolate color to match my decor. Worked out great! We bought this to be used as a pantry in my parents apartment. It's adorable and perfect for that use. The directions recommend two people for assembly, so my brother and I worked together and it took about an hour or so. It helped that my brother is familiar with woodworking and understood the directions, which he felt were clear. The pieces come out of the box in order of use and are labeled with a teeny sticker. Everything lined up perfectly. Very happy with our purchase! Exactly what the picture shows. First off, this is NOT blue. It's a washed out puke green and brown. Didn't take long to put together, but I was short 3 screws for the back and 5 of the screws for the hinges broke while installing. Was protected well in shipping, but for the quality, the price should have been closer to less than $80. I was not impressed it was supposed to be antique but it looked at more dingy than anything and I was missing a part. Once I put everything together the doors were not matching up and it is not did not look good. The cabinet was perfect for the space I wanted. Nice addition . However I noticed a paint/varnish smell when I opened the doors. I've had the doors opened for several days now and the smell has not gone away. Hoping this resolves. The small size is right for my space. I was hoping the quality of material would be better, however, you get what you pay for. Also, the fact there were no written instructions, made it more difficult to assemble. Very nice piece was not that hard to put together, was hoping it would be a little bit stronger for the money but all in all im happy with it! Like the cabinet, but had to put it together, and some of the pre-drilled holes were a bit off, so the doors are not straight and I really can't adjust them. But I would still recommend it. "Is this unit sturdy enough for my 6 quart KitchenAid stand mixer along with other small appliances?" "Is this cabinet offered in Black like the version that is a bit shorter? 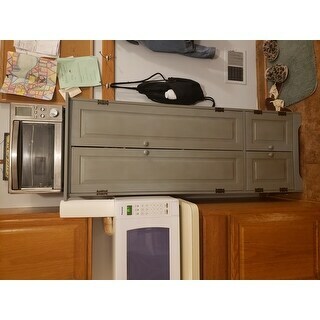 I am in need of the extra y’all cabinet but in black." Unfortunately no, this cabinet is not available in black. "Is blue the only color available at this time for the extra tall cabinet? We would prefer the white if you have it. Please advise asap." "Will this item be back in stock?" Unfortunately, we currently do not have a restock date. "Is this cabinet made of partical board or what kind of wood?" It's crap. Don't waste your money. It's particle board, not as tall as you think and mine arrived with a huge chip in the corner and missing hardware. To their credit, Overstock refunded me my money and didn't want the unit back because why bother? Even they knew it was crap. I donated it to Salvation Army Thrift Store. The cabinet is made out of MDF. "Does this cabinet actually fit a broom inside?" No, its not tall enough on the upper half, also you would not be able to put your shelves in to accommodate one. I purchased this to hold laundry detergents/supplies for a small condo that had a stack washer/dryer but no space to put supplies, it was perfect for what I needed it for. "Will this fit a standard Vinyl (music) record album cover which is 12 by 12 inches when you close the door? Dimensions note "12.25 inches deep" but Im not sure if the .25 will allow for the cabinet door to close fully? Before I order several of them I need to be sure - is there anyway you can check (i.e. have someone place a standard Vinyl record album in the cabinet to be sure it will fit)? Please let me know. Thanks a bunch!" No. those are the outside dimensions. I had to breakout an old Lionel Richie album and it didn't fit....not even close. I love the cabinet though. I have it in my bathroom for extra storage. Hope this helps.